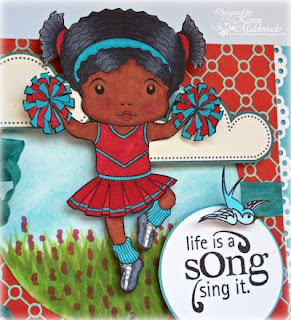 Life is a Song..Sing it with Cheerleader Marci!! Hi there, it's Karen, and wasn't that card of Eva's featuring Sweet Dreams Marci so ADORABLE!!! I just love the story behind it too..so sweet!! If you haven't peeked at it yet, just scroll down to the first post for today, and you can see how STUNNING her card is that Eva's sharing!! So, I have another card to share with you today!! My card features Cheerleader Marci, who is now available in digi for a short while..so, go visit the La-La Land Store to get yours today!!! She will be available in rubber on September 15th, along with some others from the new Marci line! 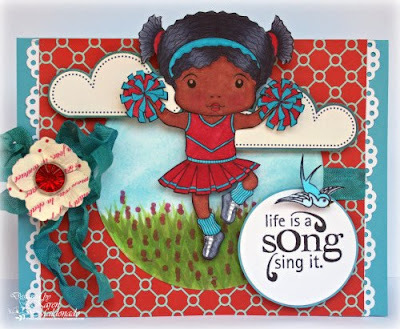 Cheerleader Marci is so excited enjoying life that she's cheering up and down!! I created little wildflowers growing in the green grass on this beautiful blue sky day using Copics and distress inks! The clouds, the sentiment, birdie, and Cheerleader Marci are all popped out for some added dimension! That's about it for today. Do enjoy the rest of your day, and I will see ya next week to share some more!! Today I bring you Sweet Dreams Marci and she is just soooooo cute even, when she is sleepy with her little teddy. I have a picture of me with a teddy when I was wee young and my hubby swears this little Marci looks just like me...hehehe. So, I really had a wonderful time coloring her, that is for sure. 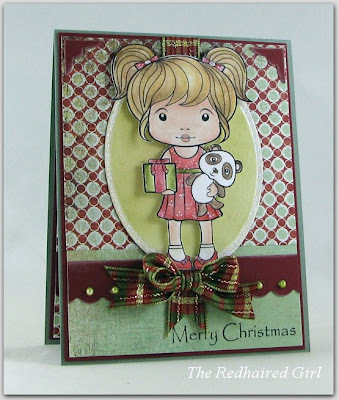 I used October Afternoon papers on this card, as I just love their color palette and it just went with the colors I colored my little Marci in perfect. Now, even though she is Sweet Dreams Marci, you can really pop any sentiment on it. I left that option open, as she doesn't even need any sentiment, that sweet face just says it all, don't you think? Hope you like her as much as I do! 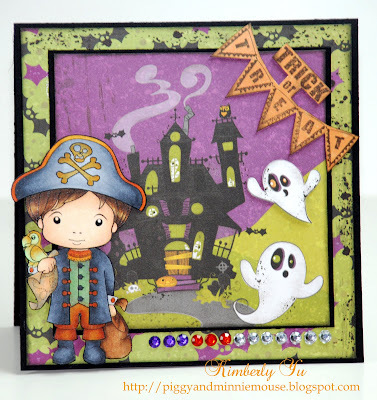 Anyway, today you will get to see another post and it will be from Karen, and I know she will have some amazing creation for you, so make sure you check back to our blog, you don't want to miss it! Good Morning, everyone! It's Monday and my turn at posting on the blog. Have you enjoyed seeing all the wonderful cards using the new images? I sure have! 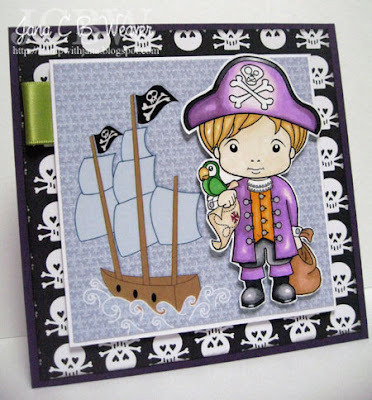 Today I am sharing a card I made using Pirate Luka. He's no longer available as a digi in the shop, so I sure hope you snatched him up while you could. Never fear, however, if you didn't. He and a few of his friends will be available in rubber on September 15th...YAY! Sweet Dreams Marci and Cheerleader Marci are currently available in the shop in digi format, but for a limited time only. I've been peeking in the Customer Gallery and I am loving what I am seeing ;D Keep up the great work! Pam emailed me this super adorable card last night and I just had to share it with you all!!! ”Aye treasure your friendship”!!! 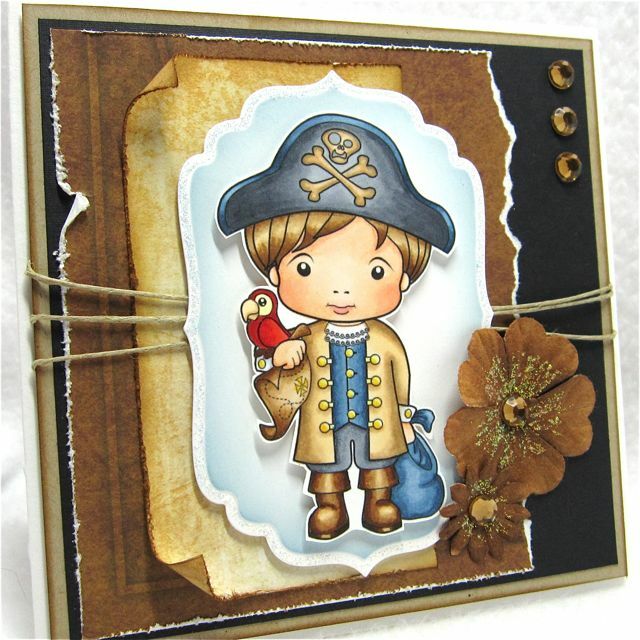 What a GREAT sentiment for a card with our Pirate Luka!! This stamp was available in a digi form week ago and you will be able to purchase it in rubber in our Halloween Release.. Coming SOON!!! Right now we have two other stamps available in digi, Sweet Dreams Marci and Cheerleader Marci. Click HERE to go shopping. And, don't forget about our STOREWIDE SALE!! Click HERE for details!! I have another Marci card for you today! This is Cheerleader Marci, she is available as a digi for a LIMITED time ONLY in our online store right now, just click HERE to purchase. Cheerleader Marci will be available as a rubber stamp starting on September 15th with Irina's new Marci line at La La Land Crafts. In the meantime we have a STOREWIDE 25% OFF SALE on existing rubber stamps going on! Please click HERE for details. I colored Cheerleader Marci with Copic markers to match a pad of Martha Stewart scrapbook paper I have. I'm sorry I don't have the marker colors for you, I colored her on a day that I was just coloring for pleasure. It took me longer to fuss over the layout of the card than it did to color Marci! Speaking of that, the layout is a sketch from A Gem of A Challenge blog that posts monthly challenges. I hope you enjoyed seeing the new Marci, have a blessed Sunday! Happy Saturday everyone! It's me, 1LuvnMama, bringing you updates and a card! I used this DP from Imaginisce and added some ribbon and pearls. Here's the inside of the card. No sentiment, but there's lots of room to write a birthday wish to someone special! If you haven't check the Online Store, the digi, Pirate Luka, is no longer available, however, we are introducing another fun Marci . . . Cheerleader Marci! :) Ain't she just cheerful? Run over and snag her up quick! That's it for me! Have a great rest of the weekend! Hello, hello! TGIF!!! Woohoo!!! Kim here presenting you BALLERINA MARCI! Ballerina Marci was previously available as a digi for a limited time. Yup, I used the digi version here! If you love rubber, no worries! She will be available as rubber on September 15th along with the other adorable Marci's! I can hardly wait because I am seriously LOVING this new line! Before I go, don't forget to check out our online store because there is a mega sale going on right now! 25% OFF on ALL of our previous designs!!! Plus, we have another cutie available as digi for a limited time! Check out CHEERLEADER MARCI!! And......don't miss out Sweet Dreams Marci! She will be gone before you know it! Okie dokie, have a fabulous Friday, everyone!!! Birthday Marci, gotta love her! This week I finally got to make a card with Birthday Marci - the first one to be introduced. I love her little panda bear she carries around - isn't he so sweet? 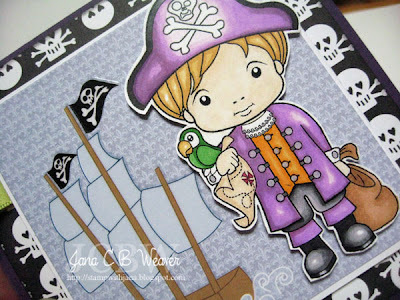 I used some Kioshi paper from Basic Grey, and this week's Sketch For You to Try from Jen Del Muro. And of course, I HAD to color her as a blond after my own sweet little Blondie!! I finished off the inside too...and look...a sneak peek! 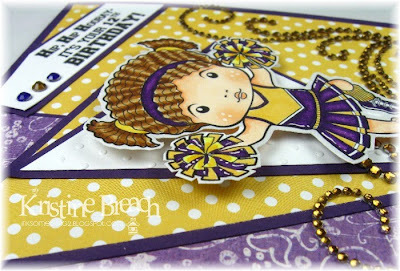 Irina has just added Cheerleader Marci to the digi store..so be sure to go check her out! She's ADORABLE!! Julia's already bugging me to color her in Cal colors for the upcoming football season - Go Bears! Hmmm, think I can turn this little guy into a Golden Bear?? You know I'll be trying! Birthday Marci will be released in rubber next month...not too much longer to wait if you didn't happen to catch her while she was here as a digi! Have a wonderful Thursday everyone! 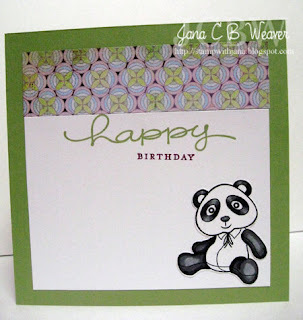 I have a FUN new card to share with you today! (Ha! I'm a poet and didn't know it! LOL -just kidding.) Hi, I'm Kristine and am so excited about this new line of stamps... are you?! They are so cute and big, and just a LOT of FUN to color!! Today we have another new Marci to show you!! Cheerleader Marci is now available for one week as a digi in the shop! 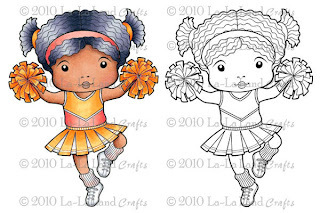 Scrapping photos of your li'l cheerleader or [any] athlete!! How about adding her to a football shaped card for a boy? Send your child's teacher a card to let him/her know you are on their team! There's so many possibilities for this cutie just by changing up your sentiment... like "Cheers! ", "Cheering you on! ", "I Knew You Could Do It! ", "Get Well Cheers!" "I'm glad we're on the same team!"... and many more! Just a couple of reminders--- we are showcasing one new stamp in the Marci/Luka line each week and making it available for purchase as a digi... for ONE WEEK ONLY. Then, they will reappear on September 15th as rubber stamps!! 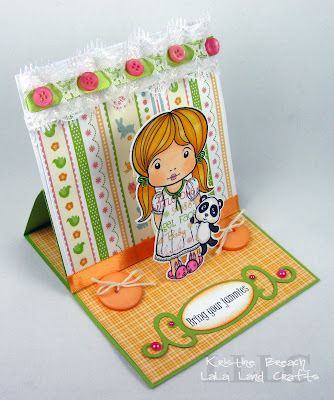 I hope you've been enjoying all the sneak peeks from our DT-- a new post goes live here at LaLa Land Craft's Blog every day with a new DT (or 2) posting their creations!! Also, Sweet Dreams Marci is still available for a few more days as a digi! Get her before she goes sleepy-bye! 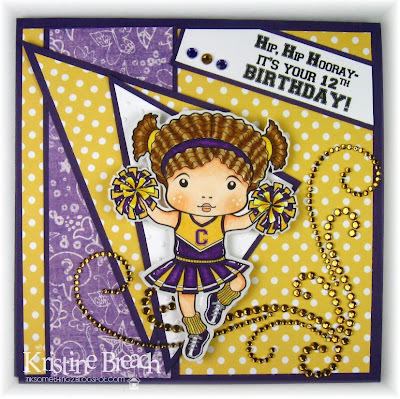 This is Eva typing away and it's the second post of the day, so if you haven't seen Karen's adorable Birthday Marci card, please scroll down to check it out, it sure is a happy little card you don't want to miss out on! 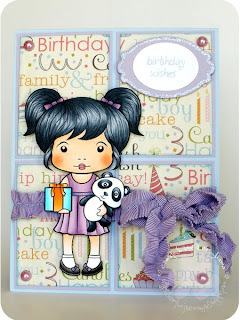 My card sharing today is with Ballerina Marci and I sure dolled her up with lots of lacy elements. 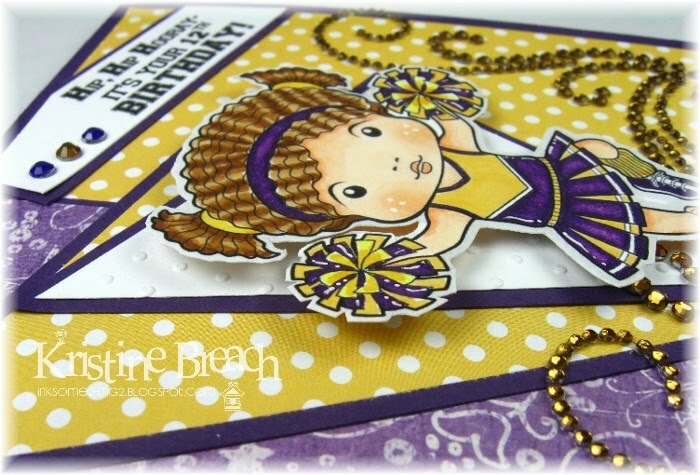 Starting with the lace card shape, which I cut out with my Silhouette, than the scroll frame was also cut out with my Silhouette, I just felt it was perfect fit for this cute ballerina. And what little ballerina wouldn't deserve pretty flowers, so I made her a little flower by rolling up paper. The papers are by Websters Pages, just had that perfect feminine look to them and I even had a pretty lace trim that has been waiting just for this little girl to show up! And check out Marci's tutu, I added some Stickles to it, I think it's just too cute. I know any little girl would love to get this card in her hand! And remember, we have that 25% off storewide sale!! Make sure you get some of the stamps you have been eying, so if you have been waiting, now is the TIME!!! Thanks for visiting La-La Land Crafts and wishing you a fabulous day! Hello there..Karen here! Sure hope you have been enjoying all the cards we've been sharing with you highlighting some of the new Marci and Luka line!! 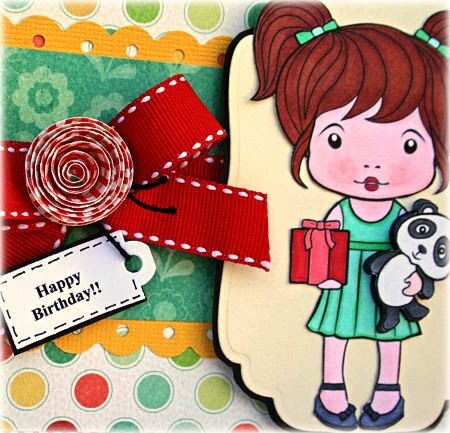 Today, I am sharing a card I made using Birthday Marci. She will be available in rubber at La-La Land Crafts Store on September 15th! I wanted this card to speak FUN..FUN..FUN!! So, I decided to use these fabulous designer papers by My Mind's Eye! There's border punching, a rolled flower made with the same paper I used to make the bottom border of the card, and I also added a sweet little "Happy Birthday" tag sentiment to the card and tied it to the bold red ribbon! 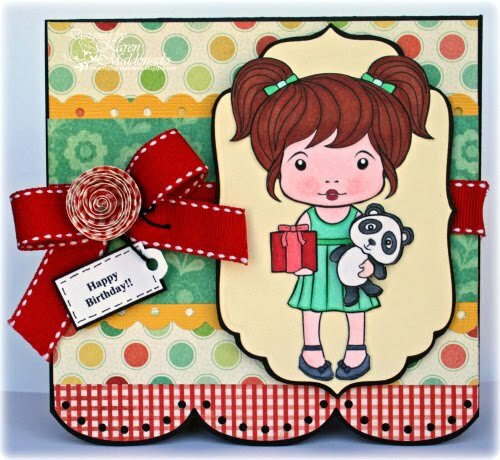 Birthday Marci's been colored in with Copics and her sweet little panda bear has been layered to pop right out, and the Spellbinder label that Birthday Marci is on also has pop dots too! Birthday Marci's all ready to wish that special girl a very happy birthday!! BIRTHDAY MARCI - "Happy Birthday"
And, in case you are interested..you can find SWEET DREAMS MARCI and PIRATE LUKA as digi's right in the La-La Land Store for purchase today!! Come back for more inspiration later at 2pm PST!! Eva's gonna have another project to share with you, and you are gonna LOVE IT!! To make room for the arrival of our new stamp line we've decided to have a Storewide 25% OFF Sale on ALL of our previous designs*!!!! Don't miss this chance!! Stop by La-La Land Crafts store today to stack up on some of your favorite Lala, Rosie and of course Animals!!! This is a great deal especially when combined with our FREE Shipping on orders over $50!! Don't forget about the Open House/Trunk Show events for our new Marci and Luka Collection!! Please click HERE for details. Hello, everyone! I am so excited! This is my first post to the La-La Land blog since we have changed the format to something bigger and better ;D We are no longer having a weekly challenge. 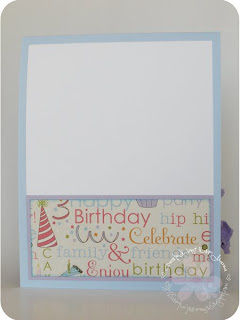 Instead, we will showcase a new card EVERYDAY on the blog with each of the design team members drafting the posts. A shiny brand new CUSTOMER GALLERY has been created for all of the fabulous La-La Land Customer creations and once a month we will hold a Customer Appreciation Day where one person will be selected to receive a wonderful prize. Sounds great! I have taken a peek in the Customer Gallery and we already have some beautiful cards in there, so thank you to everyone who has christened the gallery, and to everyone else...we can't wait to see your cards ;D Be sure to stop by the Customer Gallery frequently for added inspiration. My card today features one of the new images illustrated by Irina herself ;D I knew this woman was talented, but I had no idea she was going to surprise us with a whole new line of images! This is Sweet Dreams Marci and she is one of 5 images that will be officially released on September 15th. Sweet Dreams Marci and Pirate Luka are currently available in the shop as digi images for a limited time. Once they're gone, you'll have to wait until September 15th and then they will be available in rubber ;D I have to tell you, this new line of images is super special. 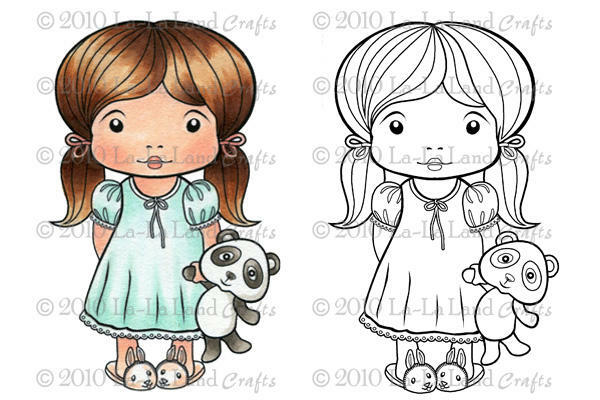 They are a dream to color and they will add personality to any card or layout creation. Pick yours up in the shop today! 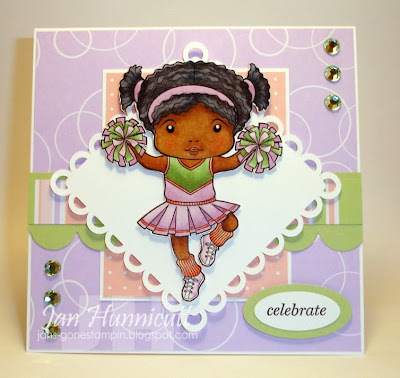 of sharing my Ballerina Marci card with you today! Isn't she just adorable?! Ballerina Marci is a new release and will be available as a rubber stamp September 15th at our La La Land Crafts store. For my card today I colored Marci with Copic markers, the layout is sketch #69 from Sweet Sunday Sketches. 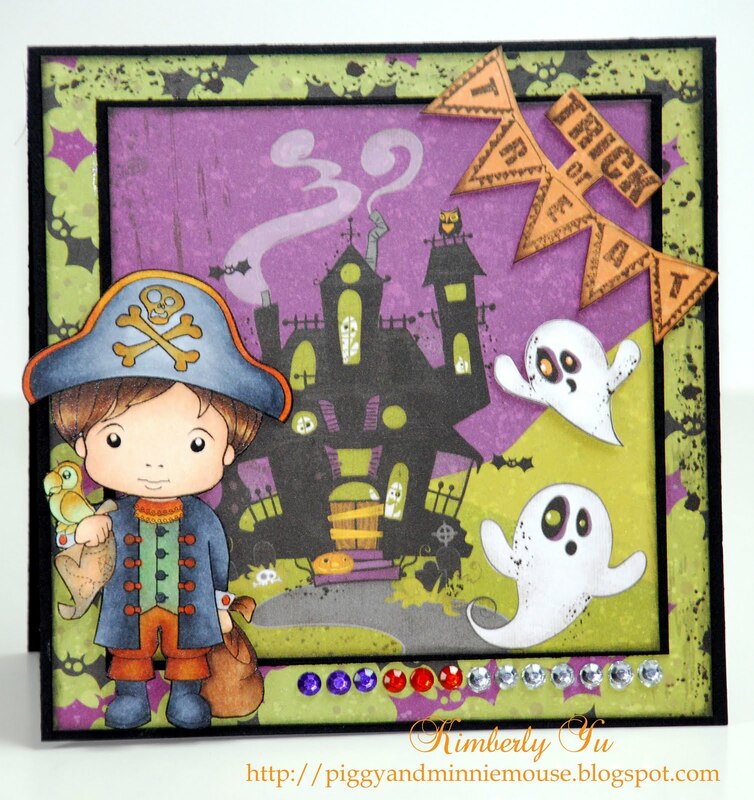 I used Basic Grey Kioshi papers and some of my favorite Spellbinders dies. Ballerina Marci is so much fun to color and such an outstanding image. I wanted to keep my card simple so she'd be the center of attention just as a cute ballerina should be! If you haven't visited in a while, I'd like to tell you that we have made some changes around La La Land! Now, you will get to see a new post each and every day... by our talented Design Team!! How fun! Also, we won't be doing our Wednesday challenges, however, we have a CUSTOMER GALLERY (link at the top of blog) in which our customers can link their La La creations anytime they want and then once per month we will have a CUSTOMER APPRECIATION DAY and award a customer with a prize--to thank you for being a customer and sharing with us your lovely creations!! How fun!! 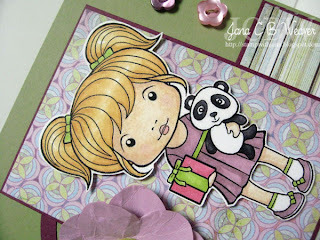 Now.. Irina is here :-) I am going to show you two AWESOME cards made by super talented Pam Sparks in the last few days!! You can find all the details about these cards on Pam's blog, just click HERE and HERE. 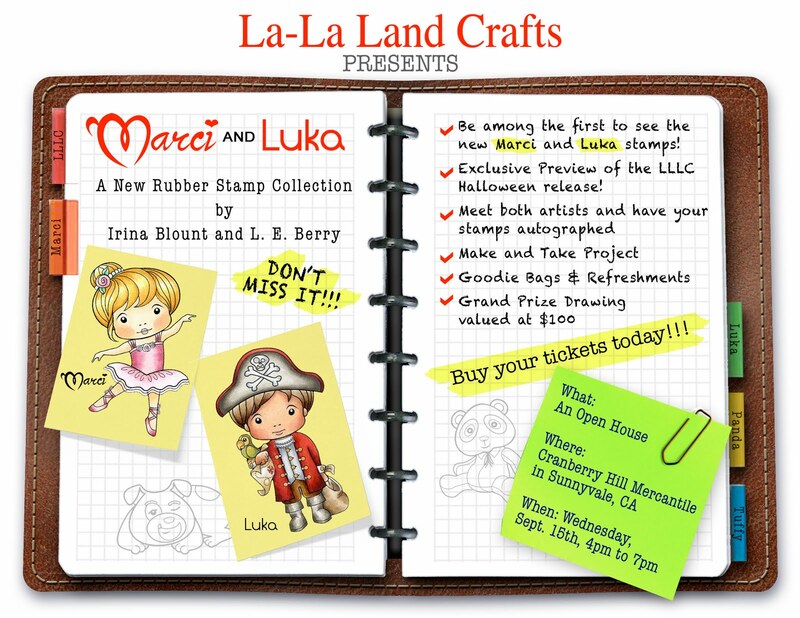 And here is one more thing that I would like to share with you today..
To kick off our new line of stamps, Marci and Luka we are going to have Open House/Trunk Show events in a couple of local and not so local craft stores!! The first one I am going to tell you about is going to happen at Cranberry Hill Mercantile in Sunnyvale, CA on the official release day - Wednesday, September 15th from 4 pm to 7 pm!!!! 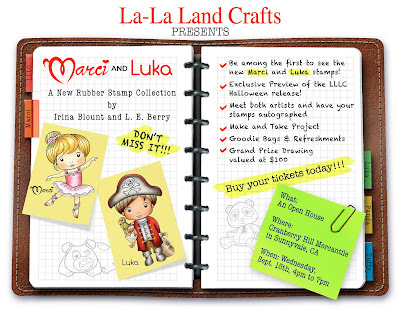 - Be among the first to see the new AWESOME Marci and Luka stamps!! - a goodie bag with a FREE stamp and other "stuff"
- Enter for a chance to win a GRAND Prize valued at $100!!! Please stop by Cranberry Hill Mercantile or give them a call at 408-736-9151 to purchase your tickets!! We are limiting this event to 50 people!! Don't miss out on this FUN party!! Hi there La-La fans! It's me, 1LuvnMama and I'm here today to share a few things with you. As you are now aware, La-La Land Crafts Blog has taken a new turn. We are no longer doing challenges here, however, you are more than welcomed to link your La-La Land creations in the new CUSTOMER GALLERY!! Feel free to gallery as many times as you would like during the month (once per card please) and then, we will have a "Customer Appreciation Day" where we will choose a random winner for a PRIZE! Woot-woot!! It could be you! Shall we dance? 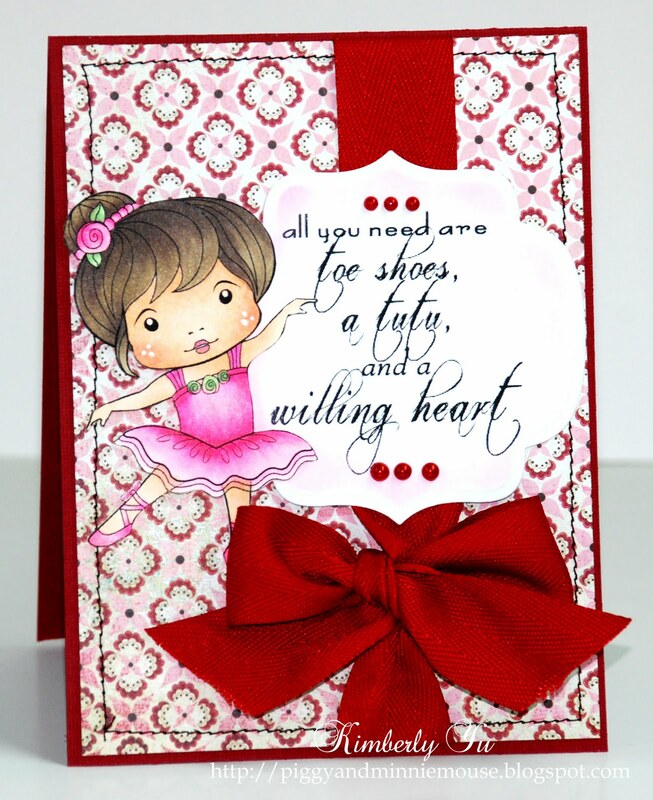 :) Here is my card using Ballerina Marci. Ain't she as cute! She was featured a couple weeks back during our Birthday Bash and was available in a digi. If you wait a little longer, Ballerina Marci will make her debut in RUBBER real soon! Hello! Kim here. Hope everyone is enjoying all the wonderful creations my teammates have been sharing throughout the week! We hope to bring everyone something new everyday here and hope you all will get inspired! As you now, we have started something totally new here at La La Land Crafts! We don't have a weekly challenge anymore. Instead, we have a CUSTOMER GALLERY for everyone to share your Lala creations! Once a month, we have a CUSTOMER APPRECIATION DAY where you could win prizes! Yup, just for sharing your La La creations! 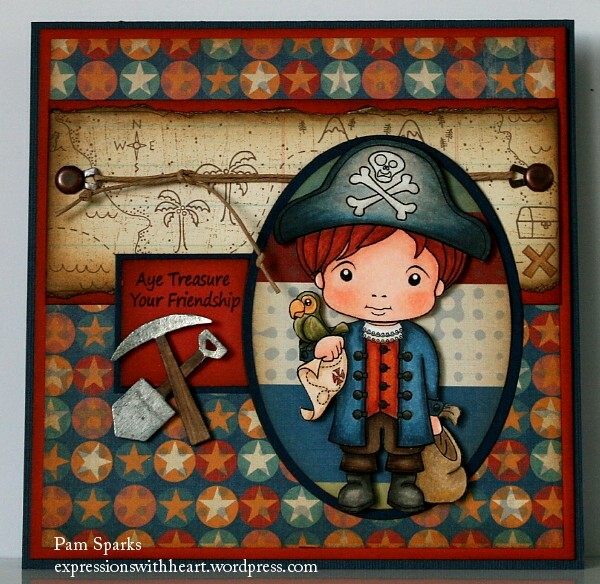 Today I am sharing this cutie pie, Pirate Luka! He is just about the cutest little pirate! Oh and he looks so much like my son! :D I hope everyone grabs him while he is still a digi! If not, no worries! He will be available in rubber real soon! Don't forget, SWEET DREAMS MARCI is currently on sale as a digi for a limited time! Be sure to take her home while she is available! Well, that's all for now! THANK YOU so much for keeping me company! Happy Friday and hope everyone have a great weekend! Hi everyone, Jana here! I'm so excited, I finally got a chance to sit down and play with the adorable new Pirate Luka - isn't he the sweetest?? 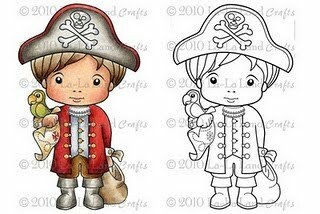 I was so excited when I first saw this little guy - especially since my little guy has such a love of Pirates (and the word Aarrrgh) He's part of the new Marci and Luka line of stamps illustrated by our very own Irina - amazing isn't she?? I sat down and colored this little guy in, then thought - I have the perfect paper to go with him! The pirate ship paper is from a DCWV stack called All About Boys. ...pretty cute, huh?? The skull paper is some old retired SU! dsp, and i thought the little bit of green ribbon helped bring out the green of Luka's little Parrot, without adding much femininity to the card. Lastly, we are no longer doing our Wednesday challenges, but we do now have a CUSTOMER GALLERY in which our customers can link their La La creations anytime they want and then once per month we will have a CUSTOMER APPRECIATION DAY and award one customer with a prize--to thank you for being a customer and sharing with us your amazing creations!! Hello *Ü* This is Kristine and I'll be posting here each Wednesday. I apologize for the late post today, but we had power outages last night when I tried to pre-post, so it had to wait til this a.m. Anywhoo... 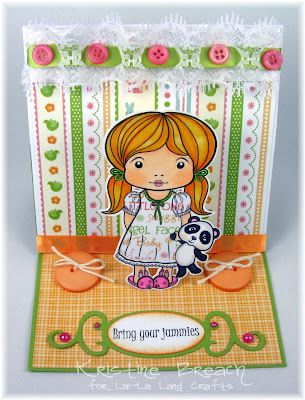 I have this little easel card using SWEET DREAMS MARCI, and having 2 girls of my own, I decided to make this a slumber party invite. I paper-pieced her night gown, and put her in her sweet little girls' room with cute wallpaper and carpet, and even some lacy curtains! Whaddaya think? Sweet Dreams Marci was released just yesterday as a digi in the shop... but will only be there for ONE WEEK, so hurry on over to buy her up!! She comes in full color and line drawing!! Also, Pirate Luka (a boy!) is available as a digi right now too, but only for a couple more days! If you haven't visited in a while, I'd just like to mention that we have made some changes around LaLa Land! Now, you will get to see a new post each and every day... by the talented Design Team!! How fun! Thinking of You - Ballerina Marci!! Hi there... Karen here and ready to share more with you today! As Eva mentioned earlier today, each Designer will be sharing a new card for you on a daily basis..and sometimes even a couple of times a day! What a treat!! So, stop by often, as we hope to continue to inspire you on a daily basis!! 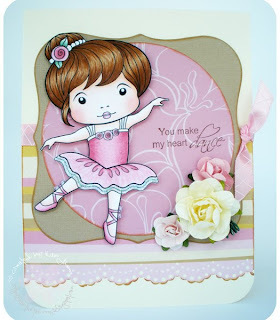 Today, I am sharing this sweet little Ballerina Marci!! She is the most sweetest thing ever!! To make her sparkle a bit more, I've added some stickles onto her little tutu and to the little tiny rosette flowers on her outfit, and on her adorable headband! I even made a little rose type flower with a few Spellbinder's labels and added a tiny pearl and some more glitter to sparkle!! There's a few additional pearls on this sentiment as well!! Ballerina Marci was introduced as a digi a few weeks during our birthday celebration! For now, we will wait just a little bit until this gorgeous stamp appears in rubber on September 15th, along with some other stamps in our new Marci line!! Ballerina Marci - "Thinking of You"
Don't forget... We have a new CUSTOMER GALLERY!! Feel free to link your La-La Land creations in the gallery as many times as you would like during the month (once per card). Then, once a month, we will have "Customer Appreciation Day" where we will choose a random winner for a PRIZE! How fun!! Eva and I will be back next Tuesday to share more, and do come back tomorrow to see what our next Designer has to share with you!! You are gonna just love it!! Enjoy the rest of your day!! Happy Tuesday! This is Eva today and last week was our last challenge, which means something new is happening!! What is that exactly? Well, instead of seeing a couple of posts a week on the La-La Land Crafts Blog, now you will get to see new creations from the Design Team EVERY single day!! Marci is the CUUUTEST little girl and I keep telling everyone, "a new girlie is in town", because she is going to go places! I just know it!!! She is so fun to color and I found myself pinching her, as I was done with different stages of coloring. Of course I used Copic markers to color her in and for some reason the color red was calling me for her little dress. 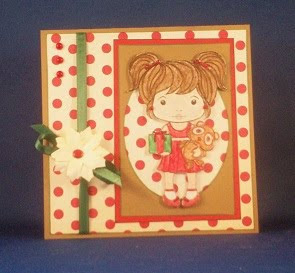 Papers I used are by October Afternoon and the card base is a Silhouette cutting file, which is another favorite. My border is cut from felt using my Spellbinder border die. So, how is that for fun? We hope you play along with us and share all your adorable La-La Land creations, we can't wait to see! 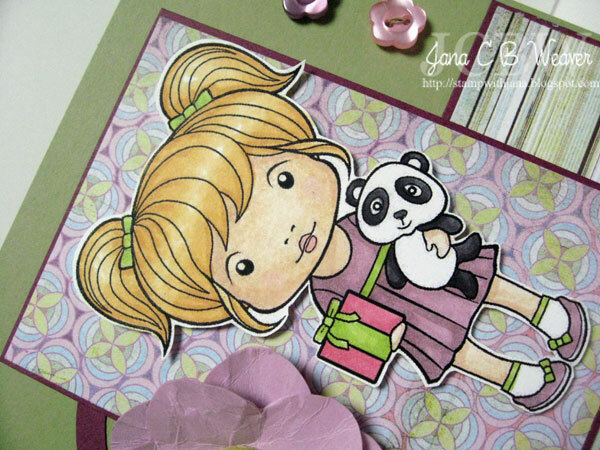 One more thing before I let you go :-) We are showing you yet another one of the new stamps from our new Marci Collection!! This is Sweet Dreams Marci!!! Thank you all so very much for playing along our final Weekly Wednesday challenge! Everyone did a fantastic job with all the awesome Christmas cards! Here are the top 3 winners! The $10 Credit to our online store goes to Elena! Congratulations, Girls! Please email Irina for your Top 3 Badge/prize! Thank you all for playing along our Weekly Wednesday challenges! Please stay tuned as we have something new starting TODAY! Before I go, I want to let everyone know that we are previewing Sweet Dreams Marci this week! You can get her as a digi for a limited time this week! Isn't she just the cutest??!! Hurry before she turns into rubber! Day 2 - La La's Birthday Beach Bash Continues!! La-La's Birthday Beach Bash Begins!